You wouldn’t get very far exploring traditional Chilean music without running into the cueca. An important symbol of national identity, the cueca’s origins are cloudy (African and Spanish influences are often cited), but the dance seems to have first appeared in the early 19th century, right around Chile’s independence. After having flourished for 200 years or so, in 1979, in the midst of Pinochet’s power over the country, it officially became the national dance. (It is also, interestingly, Bolivia’s national dance.) Despite his attempts however, Pinochet did not succeed in keeping cueca solely as a patriotic symbol. It remains something far more than that, and continues to thrive in Chilean immigrant communities across the world, as well as at home. Usually in 6/8 time, in a major key and featuring guitars, the cueca (short for zamacueca) is a courtship dance for couples, where the man symbolically plays the rooster and the woman, the hen – both of whom dance with white handkerchiefs. 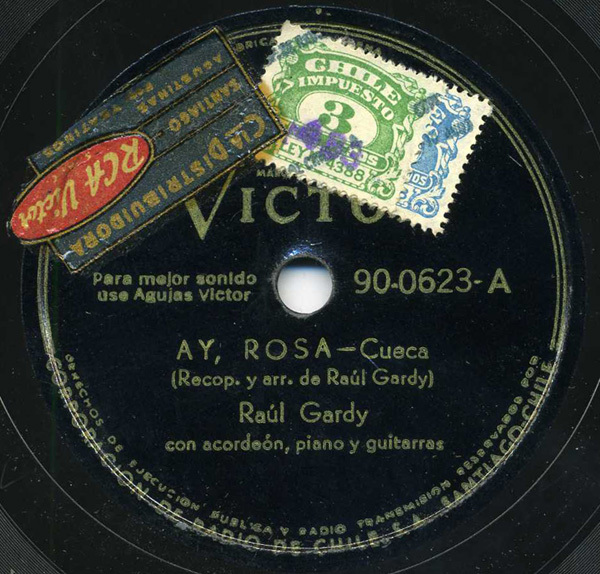 Cuecas were frequently recorded in the 78rpm era though they don’t grow on trees – Odeon and South America’s arm of the RCA Victor label probably recorded in the region the most. Raul Gardy’s cueca is joyful, and he is accompanied by guitars, piano, accordion, and spoons. For more Gardy, you could check out the CD releases Nostalgias de Chile, or Chile Tipico Vol. 3 and Vol. 4. I can’t vouch for the sound quality, but they’re out there. I also recommend this interesting 15-minute documentary on a gentleman trying to recapture cueca’s working-class and traditional roots. Lots of history and dancing therein. “Ay, Rosa” does end in F major, but spends enough time in D minor that I wouldn’t have been startled if it had ended there. This ambiguity as between a major “home” key and its relative minor is a characteristic of much traditional South American music that I’ve heard. indeed, the cueca advanced during the pinochet era was a landowner´s cueca, as pious and un-bohemian as possible, as opposed to the suspect variations being exercised prior to the coup. this very much in line with the conservative view of the upright and noble chilean culture. incidentally hector pávez, a folklorist who was shortly exiled, had a meeting after the coup at his record label with military representatives. he was told that hybrids and northern (indigenous) instruments were shunned, as they were deemed foreign to proper chilean culture. music was crucial in the ideological battle. any idea of the date for this one Boss? Don’t know the precise date, but I would say about 1946. Take a look on this site about chilean cueca, real good.